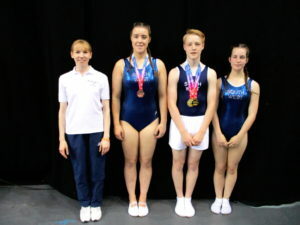 Flyers trampolinists won two individual gold medals and one individual bronze medal at the NDP regional team finals at the Barclaycard Arena in Birmingham on 16th and 17th June. The regional finals is a national event that has 13 regional squads across the UK competing against each other for the regional team trophy and individual medals. Okehampton’s trampolinists qualified for the South West squad in March. Vicki Pritchard, Okehampton Gym, Trampoline & DMT Club head coach, was also selected as a South West squad coach. The South West regional squad had two training days in the months leading up to the competition, and orientation training at the Arena the evening before the competition for the performers to get used to the apparatus and the size of the venue. Representing the South West, Owen Pitman competed trampolining first, with two outstanding routines, to win the Men’s NDP4 13+ trampoline event. He then competed four brilliant passes in the Men’s NDP1 13+ DMT to secure his second gold medal of the day. Imogen Spooncer and Madison Vine were next to compete in the Women’s NDP1 13+ DMT. Both performed superb passes, with Imogen sticking every landing to win an individual bronze medal, and Madison securing 9th place. The NDP Individual Finals is another national trampoline, tumbling and DMT event, to be held at the Motorpoint Arena in Nottingham on 7th and 8th July. The top eight in each class at the regional team finals in Birmingham are eligible to compete at this competition, where Owen and Imogen will be representing OCRA Flyers instead of the South West. To see photos and videos from the regional team finals at the Birmingham Arena, go to https://gymandtrampolineclub.ocrasport.org.uk/ or visit OCRA on Facebook at www.facebook.com/ocrasport/. A big thank you to Sport England! Last year, Okehampton Gym and Trampoline Club was still training on recreational level school trampolines, and had no double mini trampoline. Thanks to a £10,000 grant from Sport England and the club’s own fundraising efforts, the club was able to buy a top-level Ultimate 4×4 trampoline, a double mini trampoline and three sprung track panels to lengthen the club’s competition tumble track to make it suitable for teenagers and adults. The grant was to set up an adult gym and trampolining session and increase sporting opportunities for teenagers and adults. The session now runs every Thursday, 8.30-9.30pm, in the Okehampton College Gym. It is a fun, friendly class and is open to anyone over 13 years old. Beginner and advanced gymnasts are welcome. The club has also set up a separate weekly double mini trampoline session to offer children and young people the chance to try this brilliant gymnastics discipline and offer additional training for competing gymnasts. The grant from Sport England has made a huge difference to what OCRA can offer young people, and has helped more children, teenagers and adults lead a healthier lifestyle. People of all ages use the new equipment at OCRA’s sports festivals, displays, holiday camps and Sport & Art days, as well as at the term-time club. Having this equipment has also helped young people who want to progress further in sport achieve regional and national results. A big thank you to other funders that have made donations to OCRA’s gym and trampoline club, including the Inner Wheel of Okehampton, the Rotary Club of Okehampton, the Manor House Hotel and Okehampton United Charities. The club has a long waiting list and is now raising money for two more trampolines and end decks to help more young people to get involved and develop their trampolining skills, and are looking for sponsors. If any local businesses would like to sponsor the club, or anyone would like to make a donation to help more young people develop trampolining in Okehampton and the surrounding area, OCRA would be very grateful if you could contact Vicki Pritchard at vicki@ocrasport.org.uk.